Three years after the beginning of the Arab Uprising, and despite numerous supposed false dawns since, there remains little reason for optimism in Syria today. In Cocoon, Paris-based artist Walid El Masri’s intricate reproductions of the dormant subject matter serve both to evoke the isolation and withdrawal prompted by the ongoing bloodshed in Syria, as well as coaxing out a deeper meditation on the wider life-process. While El Masri’s first solo exhibition in London is undoubtedly challenging, the strength of his work as a totality reveals itself in the lingering sensations of unsettling horror and flickering beauty which remain long in the memory. Upon entering the gallery, the spectator is struck by several sensations. Firstly, the grim tones of grey, black and blue which dominate the subject of the works, a solitary tree laden with cocoons, immediately impress a discomforting sense of death and despair. Although the soft tones and rough texture of El Masri’s cocoons initially express an exceptional shimmering splendour which the eye is swiftly drawn to, proving a welcome respite from the surrounding desolation, the viewer gradually becomes aware again of the setting in which they are situated, into which they must be re-integrated. From here, a battle is drawn between the slivers of hope which can emerge from the cocoon and the bleak reality of its environment, which threatens to envelop it in each subsequent image. Here, El Masri’s emphasis on the liberating creative potential of subjective repetition, with constant subtle variations on a simple form, is highly poignant. So, too, is his usage of a vanishing point beyond the canvas – a technique which he has previously acknowledged as a Japanese style which ‘instinctively made sense’ii, and which has been likened to the early abstract expressionist works of Yayoi Kusama. In doing so, the subject is gradually emancipated from its form, becoming instead a platform from which new sensations can be expressed, while the incompleteness of the individual work is also emphasised. Nevertheless, while each work lacks even its own unique name, glimpses of individuality emerge in every painting. El Masri’s explanation of this deliberate choice – ‘the title is extracted from the subject of my work, in a simple manner that engages the viewer without any additions that may give away too much’ – is rendered apparent in the varying numbers and sizes of cocoons on each tree. More obviously, however, primary colours often burst through and threaten the overall dourness of the canvas, yet even their shades – toxic yellow, blood red and royal blue – weigh heavy with ambiguity. Only at the end, in a blur of blue and silver, does he hint that the cocoons may mature, after all. The end result, in shown in Cocoon, is an exhibition where each work cannot be fully understood individually, but instead converge into interlocking sections of a wider totality – yet this in turn quickly gives way to a faint sense of incompleteness, as one becomes aware of the need for more to sustain the illusion of wholeness further. Just as in life generally, in an era when all reports from Syria are notable for the incompleteness, it is this sensation that provides such a powerful illumination today. 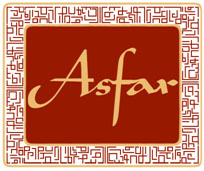 All writers' views in articles are their own and do not necessarily represent the opinion of the Asfar team.